Finally available! 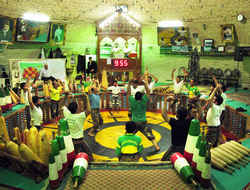 Meel (Persian Clubs / Clubbells). 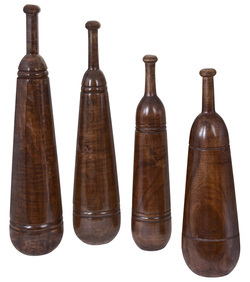 Ok so it has been a fun journey so far; and I'm proud to say that our authentic hand made Persian Meels (AKA clubs / jori / indianclub / clubbells) are now available for sale. You can get them on pre-order right now, special launch and Noruz (Persian New Year) promotion of 25% discount on all pre-orders. promotion ends 30/04/2014. So get your orders in before then. Contact me if you have any questions. We'll announce the shipping costs available in the next couple of days. In the photo you can see the different shapes and sizes (from left): 5kg, 3kg, 2kg and 7kg Meels. Matching Shena boards will also be available plus some other goodies...more photos will be posted soon. What are the similarities between Persian Yoga (Pahlavani) and Indian Yoga? What are the differences between Persian Yoga (Pahlavani) and Indian Yoga? Persian Yoga is much more dynamic in nature, e.g. you rarely hold a pose for a long period of time and there's constant movement. 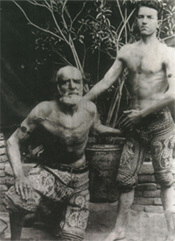 Persian Yoga for Longevity of health & Lifelong Strength. The most general principle of training for longevity comes down to a short but sweet slogan: "Use it or lose it." The application of this idea involves looking at how the human body is designed. It's designed for action. Bones, joints and muscles need to be used, or over time, they will atrophy. When you exercise, in particular exercises focused on building strength and muscle endurance such as in Persian Yoga, bones respond to challenges and increase their resistance to fracturing. The muscles around joints build up to protect critical parts of the body like hips, knees and ankles. Muscle groups get tougher and stronger, rather than withering away. 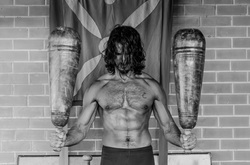 Zurkhaneh - Persian Yoga & Martial Arts Conditioning utilizes coordinated, simple, dynamic and fluid movements in the body's entire range of motion to strengthen and condition the body holistically i.e. targeting muscles, joints, ligaments, tendons etc, as it lays the foundation for lifelong strength and longevity of health. I have always been struck by how the most powerful athletes in the Zurkhaneh arena are the more senior; above 40-50. Younger practitioners, who are often considered well-trained and fit, have a hard time keeping up with the 'old-timers' as they move their body gracefully to the beat of the drum while moving between beautiful, yet strenuous, asanas (postures). And in these simple beautiful movements is the truth about what is really important in training; that consistency trumps intensity; all the time. That intensity is born from consistency. That one cannot force it, one has to lay in wait for it, patiently, instinctively, calmly and be ready to grab it when Grace lays it down in front of you. To learn more about Zurkhaneh - Persian Yoga & Martial Arts Conditioning contact us for a free/donation based beginners workshop. The ability to be cognizant of proper distance, timing and rhythm are factors that separate the great athlete from a good one. These factors are vital qualities for a martial artist, within any form or discipline. This is why the Great Bruce Lee took up Cha Cha dancing, and later became a champion Cha Cha practitioner. Bruce Lee incorporated these skills in a training form which he called 'Interaction Drills'. 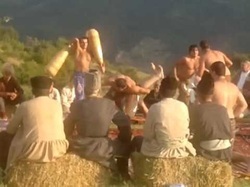 This is also part of the fundamental principles behind whirling practices as done in Zurkhaneh. The whirling and the practice of 'kicking' (Pa Zadan in Persian) are aimed at improving and increasing the athlete's sense of coordination, control, balance and judgment of space and distance. These exercises have the added benefit of increasing and improving cardio endurance and concentration. 4. Perform targeted exercises, while progressively increasing resistance, to build stability and power. It is very important to do movements that build the posterior deltoid, and perform rowing movement to focus on the scapular retraction action, as well as a 'reverse shrug' to focus on scapular depression. If you have an injury always consult a health professional first. A big thanks to City of Sydney and AICO (Australian Iranian Community Organisation) for giving Zurkhaneh Australia the opportunity to introduce Persian Yoga & Martial Arts Conditioning to Sydney. For those who could not attend please access the presentation and notes below. 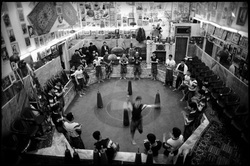 Zurkhaneh - The earliest known private gym. Zurkhaneh is made up of 2 words in Persian; Zur meaning Strength/Power and Khaneh meaning Home/House. Today it is used to designate the place for practicing Pahlavani Sports i.e. 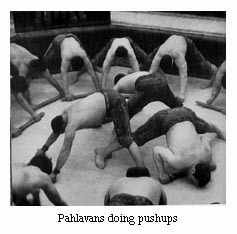 Koshti (Wrestling) Pahlavani and Martial Arts Conditioning which include Yoga like flexibility postures combined with heavy strength and endurance exercises using tools such as the Persian Meel (Clubbell), Shena (Push-up board) and Sang (Heavy Shield). In the past there were no fitness centers as we know of today; the Zurkhaneh fulfilled that function in the Iranian society much like the Akhara did in the Indian society. 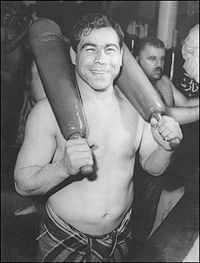 The Zurkhaneh is the earliest known form of privately operated fitness centers that were open to the general public, much like the fitness centers operated by Kaveh Akbari and Amir Fazeli here in Sydney, they were established by a Morshed (Guru) who understood and could teach principles of physical conditioning. 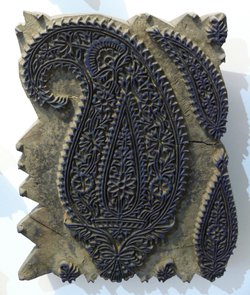 The Zurkhaneh is one manifestation of the importance that is placed on holistic health and wellbeing (Tandorosti in Persian) in the Persian culture.